You'll be £19.99 closer to your next £10.00 credit when you purchase Pepys’s Navy. What's this? This is a hugely significant book for historians, naval enthusiasts and for all those with an interest in Pepys and this colourful era of the seventeenth century, and a new affordable paperback edition will be widely welcomed. Davies’ own book on the other hand is strictly factual and would be an indispensible reference source for any regular Pepys reader. It is thoroughly researched, clearly organised, rigorous and detailed. I think Pepys would have loved it; in some ways it is the book he never wrote. I heartily recommend it. The readable text and affordable price of this edition will further increase its accessibility to scholars and nonscholars alike, who will eagerly sign on for the passage. A first class reference book as well as a great visual record of forty years of naval history. Recommended to all. This book is excellent, verging on outstanding. If the Navy’s history interests you buy this book. If it doesn’t, shame on you and buy this book. This fine book covers all aspects of the English navy in the second part of the 17th century, from the period when the fleet came under parliamentary control after Charles I’s defeat, until the accession of Mary and William of Orange in 1689 when the long period of war with the Dutch ended. This is the era that begat a permanent Royal Navy in the modern sense of the word. The book covers shipbuilding, the types of ships used, dockyards, administration, the foreign navies and the three major wars which were fought against the Dutch in the Channel and the North Sea. It is proper that this fine book is named after Samuel Pepys, who, in his thirty years of service, did a great deal to innovate and improve the navy, readying it for a century of struggle with the French. This book is essential for anyone with an interest in the Royal Navy, the Civil War and Restoration period, and indeed Pepys himself. Indeed, this book truly deserves the Samuel Pepys award it has won. JD Davies' definitive work on the British Navy in the second part of the 17th century looks in great depth at the various aspects of naval matters from the different forms of recruitment, shipbuilding and the different types, life at sea, and the all-important gunnery. It was a time when the Navy became a more professional body and fought three major wars against the Dutch. The sections describing tactics and battle provides some fascinating atmosphere of what it was like taking part in naval warfare with contemporary illustrations adding further character. Individual chapters describe the battles of Scheveningen, Lowestoft, and the Texel, putting the reader in the picture. First published in 2008 - and winning the Samuel Pepys Prize and Latham Medal the following year - this reprint will doubtless impress a new raft of readers. The book is beautifully written, as one might expect from such an accomplished author and historian... This is an indispensable volume for anyone interested in the period, its ships or the development of the sailing navy into the formidable force it became at the height of its might and influence. This superb books deals comprehensively with possibly the most tumultuous period in our country's history........ This is not only an impressive technical publication to satisfy the dedicated researcher, it is also a jolly good read for the enthusiast. DAVID DAVIES, formerly Deputy Headmaster of Bedford Modern School, is the country's leading historian of the navy of this period and the author of the critically-acclaimed Gentlemen and Tarpaulins. Shortlisted for the Mountbatten Literary Award for Britannia's Dragon: A Naval History of Wales. 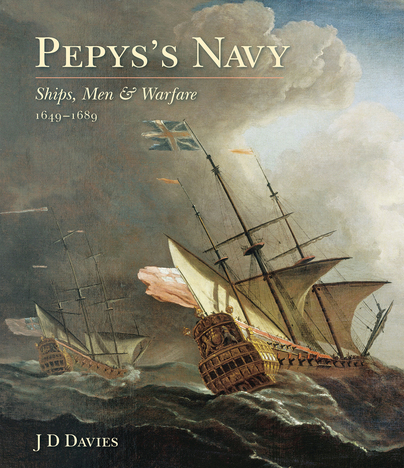 Winner of the Samuel Pepys Prize for Pepys's Navy: Ships, Men and Warfare 1649-89.